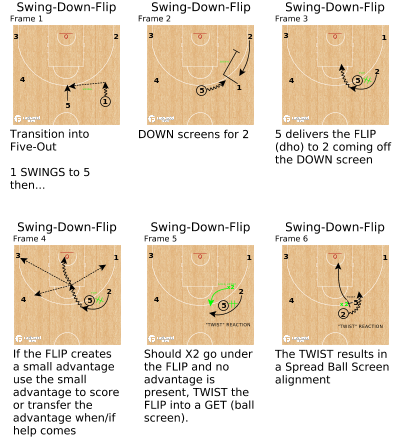 Combining elements of offense to form three-player early offense molecules to create an advantage. Offense, like all matter in nature, is comprised of elements. These elements are arranged and sequenced to create different molecules. Similarly, combining the most basic offensive elements in various sequences creates offensive “molecules” that exist to create an advantage. Thanks to RAMP member Billy Armstrong, Head Boys Basketball Coach at Bergen Catholic (NJ) High School for the video clip! The image of Swing-Down-Flip above also introduces the TWIST “reaction.” A reaction is different than an element in that it is a read in response to the defensive tactic. The offense reads that the defense goes under the Flip and reacts by “twisting” or rescreening into a ball screen to create an advantage. These are just two of the many examples of three-player molecules that can be fashioned from the fundamental elements of offense. These molecules serve as a bit of false motion to get the offense to a common endpoint. From there an advantage is created and the offense manufactures points using, maintaining and increasing the advantage through its offensive principles. 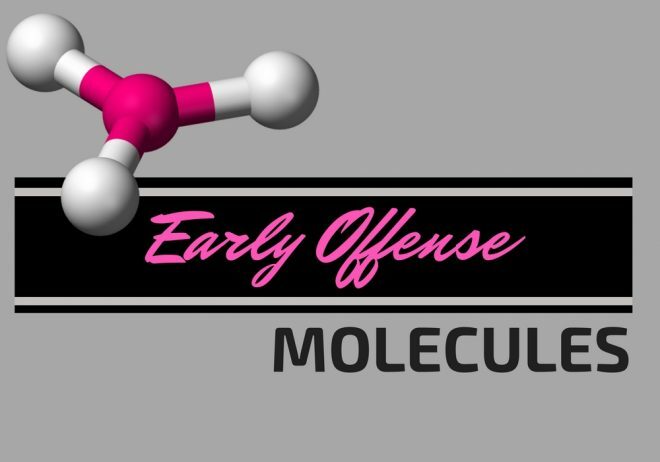 Further Reading: Full eBook on Early Offense Molecules!